Celebrations Confetti. Sold in a 1/2 oz bag. Available for different occasions. 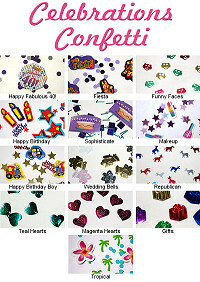 Simply Fabulous at 40 confetti, Fiesta confetti, Funny Faces confetti, Happy Birthday confetti, Makeup confetti, Happy Birthday for Boy confetti, Wedding Bells confetti, Republican confetti, Teal Hearts confetti, Magenta confetti, Gifts confetti, and Tropical confetti. Please see detailed description for more information. Celebrations Confetti. Sold in a 1/2 oz bag. Fab 40 - Purple and Silver Dots with Larger Octagon shape that says Simply Fabulous at 40. Cardboard octagon cutout is approx 1 inch wide. Fiesta - Purple and Black Dots with Larger Fiesta and Pi?ata's. Dots are standard hole punch size. Funny Faces - Multicolor Funny Faces 0.25 inches. Happy Birthday - Blue Happy Birthday with Red Stars and Larger Candles and Stars. Words are approx. 1.5 inches wide and the candles are approx 1.5 inches tall. Sophisticate ? Purple Squares, Green Strips and Larger Birthday Cake with Candles. Cake cutouts are approx. 1 inch wide. Makeup - Misc Makeup with Iridescent, Pink and Lavender Stars. Makeup is approx. 1/8 inches tall. Happy Birthday for Boy - Red Happy Birthday with Gold Stars and Larger Trains and Police Cars. Vehicles are approx. 1 inch by .75 inches. Wedding Bells - Gold, Silver, Magenta, White and Iridescent Wedding Bells. Approx. 1/8 inches. Republican - Red, Silver and Blue Donkeys. Approx 1/8 inches. Teal Hearts - Raised Swirl Design. Magenta Hearts - Raised Swirl Design. Gifts - Multicolor Gift Packages approx 0.5 inches. Tropical- Light Blue Dots and Palm Trees with Larger Pink Flowers. Palm trees are approx. 1 inch tall and the flowers are approx 1 inch wide. All sizes noted are approximate and photos are not to scale. Some images enlarged in comparison to others so detail is easily seen.